The cabal of alt-right, morally decrepit billionaires that run the National Football League has officially blinked. The league, in a joint statement with the NFL Players Association, has announced that it is suspending—for now—its own recently adopted policy of fining or suspending players who don’t stand “at respect” for the national anthem, until further review. What accounts for the about-face? It was a tsunami of a backlash that flooded the land of the Dolphins. 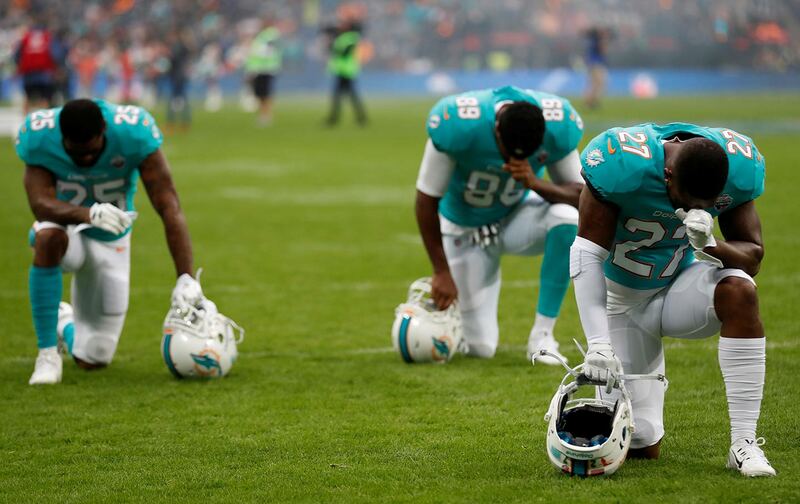 According to a Thursday report by the Associated Press, the Miami front office had drafted a new team disciplinary policy where players who protest police violence or racial inequity—or Trump, or the iron hand of the NFL executive class—during the anthem could encounter stark punishments. Players on the Dolphins would have faced fines and suspensions of up to four games. (This is a league, keep in mind, which just last month announced that it was suspending Tampa Bay Buccaneers quarterback Jameis Winston for only three games for sexually assaulting an Uber driver). But within hours of the revelation, the Dolphins—and the NFL—were reeling. Stephen Ross deserves every bit of criticism coming his way. But his own exposed hypocrisies have arisen from the NFL’s broader approach to this question. At the risk of stating the obvious, the league’s punitive policy had nothing to do with the anthem, and everything to do with silencing black voices speaking out against police violence. Imagine if players said that they were taking a knee during the anthem as a tribute to the troops. No one would have blinked. This is about the political substance of what they are doing. The Dolphins were merely the first team tasked with submitting to the league what their punishments will be. As tweeted by ESPN’s Jeff Darlington, “31 other teams will submit similar statements to NFL declaring how they might potentially discipline players for any number of rules violations as they do each year. And now, all of them will be scrutinized for how they individually address protests. 31 more PR problems for NFL.” This is what the NFL now hopes to head off by stating that its anthem policy is back under review. Stephen Ross wanted to eliminate that platform. It will not happen without a fight. Here’s hoping that every member of the Miami Dolphins takes a knee at the start of the 2018 season, goes all “I am Spartacus” on Stephen Ross, and blows his desiccated mind. You can’t suspend everybody, but it would be hilarious to see him try.